Protein plays an important role in a well balanced diet, it is essential for the body. The key parts in our bodies would not hold together properly without it. Protein is also essential for metabolism, immune system function and regulatory hormones. Hemp seeds are a high, whole food protein source containing all nine essential amino acids. They also include essential fats, Gamma Linoleic Acid (GLA), fiber, iron, zinc, carotene, B-Vitamins (1, 2, and 6), Vitamin D, Vitamin E, calcium, copper, potassium, chlorophyll, enzymes and more. Hemp seeds taste incredible! They have a creamy texture and a rich, earthy flavor. Hemp seeds can be blended into shakes, nut milks, nut butters, smoothies, and ice cream for a creamy taste and consistency. They can be sprinkled on top of food such as yogurt, salads, granola, etc. Hemp seeds can also be used in baking, sauces and spreads! 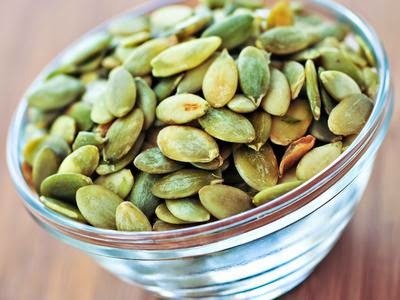 Raw pumpkin seeds are truly a superfood! Among the many benefits, they are high in protein, zinc, iron, magnesium and omega-3s. By sourcing living seeds, we preserve their inherent nutrients and enzymes, providing your body with healthy fuel! Chia seeds are exceptionally nutritious. They have high amounts of protein, fiber and many other essential minerals. They are also high in Omega-3, antioxidants, B-Vitamins, calcium, and boron. Chia seeds are a great food for runners. Because they absorb ten times their weight in water as they expand, the water will then be released slowly and evenly into your system. This allows for maximum hydration, which is key when running long distances, during marathons or especially in high heat, where runners lose more and more fluids through their sweat. Bee pollen is very good source of protein, 20-40%. It can rapidly pass directly into blood from stomach in about 2 hours after ingesting. Bee Pollen has been considered to be one of the most nutrient packed foods in the world, often called “nature’s perfect food”. It is an alkaline food, loaded with minerals, antioxidants, micro-nutrients, trace elements and enzymes. Consuming bee pollen is an incredible way to balance an over acidic system. Bee pollen contains 18-22 amino acids including tryptophan, lysine and methionine. Amino acids nourish the brain, protect the body against disease, and play a critical role in metabolizing nutrients. Bee pollen also has an expansive array of Vitamin B complexes, Vitamins A, C, and E.
Mesquite powder is high in protein, low on the glycemic index, and rich in vitamins and minerals such as: iron, zinc, calcium, lysine, potassium, magnesium and dietary fiber. It digests slowly and does not cause spikes in blood sugar, making it a great choice for diabetics. Spirulina contains over 60% complete protein (almost three times as much as that found in beef! ), it has high concentrations of many other important vitamins and minerals, such as B complex vitamins, vitamin E, carotenoids, iodine, iron, manganese, zinc, essential fatty acids such as gamma linolenic acid (which is only otherwise found in mother’s milk), and more beta carotene than you can find in carrots! Spirulina is also one of the few plant sources of vitamin B12, which is essential for healthy nerves and tissues. Cashews are an incredible superfood providing the body with essential vitamins and minerals! Cashews are a great source of plant-based protein, iron, magnesium, zinc, copper, and trace minerals. Cashews have a mild, creamy flavor and smooth texture. They can be enjoyed plain as a healthy snack, or used to make nut milk or cream, dairy-free sauces & dips, and are a wonderful addition to smoothies, salads, stir fries, and trail mixes. Goji berries are packed full of natural protein, trace minerals, essential fatty-acids, amino acids, antioxidants, and over 20 different vitamins and minerals. For thousands of years, traditional Chinese Medicine has used this revered fruit to enhance the immune system and treat more than 100 different ailments. The delightful, ruby colored Goji Berries are an excellent, healthy, high energy snack. These dried goodies give a vibrant burst of nutrients and flavor to any meal or snack. You can add them to smoothies, tea, cereals, salads or desserts.